When you are feeling hungry and your main meal of the day is some time away, try not to reach for the biscuit tin. High calorie sugar snacks, low in nutrition, will simply give you a brief sugar rush followed quickly by a drop in energy levels, leaving you feeling as hungry as before. If you decide to have white bread, French baguettes make excellent, healthy snacks. In summer, give recipes a Continental twist with ripe tomatoes, peppers, olives, if liked, and herbs. A long loaf should keep hunger at bay for four people. Rub a cut clove of garlic over the bread before piling on the vegetables and drizzle olive oil over the fillings. You should not need butter or spread. Low calorie foods like oatcakes make healthy eating and are good for supplying slow-burning energy. Top generously with tinned tuna or cottage cheese, accompanied by crunchy raw vegetable sticks such as cucumber, celery, peppers or carrots. Pitta pockets are readily available now and make a healthy substitute for bread in recipes. Fill with salad vegetables and a little cooked, cold meat such as chicken or turkey, in a tangy, low calorie yogurt dressing. Mix diced cucumber into plain organic yogurt, with a pinch of curry powder for added taste. Experiment with your own recipes for dressings. You may feel it is worth having a ready supply of healthy snacks cooked and in the fridge for those times when you or the family are peckish. Chicken drumsticks are delicious cold and are available by the tray in most supermarkets. Grill them, remove the skins and stack the cold drumsticks wrapped in foil in the fridge. Prepare some raw vegetables and tomatoes to eat with them. Spanish omelette, an old favourite, is a quick filling snack at any time. Make sure you have potato leftovers by cooking a few extra for dinner. Dice the cooked potatoes and finely chop a small onion. Heat a little oil or margarine in a small frying pan and fry the vegetables until heated through. Add the seasoned eggs and cook until firm. If you are not in too much of a hurry for your snack, you can always pop a potato in the oven to bake. Scrub the potato, pierce with a fork and rub lightly with oil, if liked. Cook on a baking sheet in the oven for an hour or so, depending on the size of the potato, at Gas 6 (200 degrees Celsius). If this is just a snack, skip the recipes that make for a main meal and keep the calories down by using simply a little low fat spread on the baked potato, or a tablespoon of savoury cottage cheese or low calorie coleslaw. Don’t overlook the perennial beans on toast. Use a thick slice of wholemeal or granary bread for the toast, dispense with any butter or spread, and pile with beans for a filling snack, rich in fibre and protein. 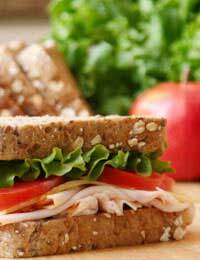 Make one or two sandwiches of bread and grated or sliced cheese, with a little butter, margarine or low fat spread. Dip the sandwiches in beaten egg mixed with 1-2 tbsp milk. Fry in a little hot oil until crisp and golden brown. Serve with some salad.